The Thomas Wolfe Memorial State Historic Site preserves the historic boarding house in downtown Asheville known as Old Kentucky Home. The house, a National Landmark, has been a memorial to Asheville’s native son and North Carolina’s most famous author Thomas Clayton Wolfe since 1949. Thomas Wolfe lived in the Old Kentucky Home boardinghouse from 1906 at age six until he left for college in 1916 at age 15. The historic home is exhibited much like Wolfe would have remembered it as a child. Today it provides an excellent opportunity for students of all ages to learn about Asheville history, early 20th century household technologies, and a giant of American literature, Thomas Wolfe. Admission is $2.00 per person (plus 7% sales tax, unless tax exempt) for our school group programs. 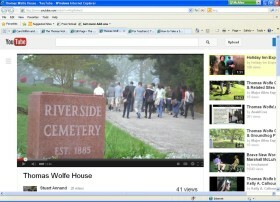 A visit to Thomas Wolfe Memorial will last about 1 hour. Due to the limited capacity of the house and visitor center we can accommodate approximately 60 students onsite at one time. Once scheduled, you will receive a written confirmation of your trip along with important information. Explore our website and view the Tours and Activities page for our current program offerings. The programs can easily be adapted to a number of age groups and courses. Please feel free to use the History pages from our website and the pre-visit and post-visit activities offered at our Lessons and Programs page. To schedule your field trip please call our Education Specialist, David Rayburn, at (828) 253-8304 or email him at david.rayburn@ncdcr.gov. After your visit please consider completing a quick survey and give us your feedback about your experience. We are committed to making a field trip to Thomas Wolfe Memorial a memorable part of your student’s classroom experience.